The reviews and comments on Alien: Isolation are completely mixed. Never before have I seen such opposing viewpoints to a single game. While some criticize the game’s relentless (and it is relentless) difficulty, others praise it for not pussyfooting with the gamer’s ability. I’m used to games where all of your problems with pesky monsters or villains can be solved with weaponry. The game’s revolver can kill humans, but dropping an android will take an entire 6 rounds and then some, with the noise attracting more and more of the androids to your location. My gun has solved exactly zero problems for me. The flamethrower is great for fending the Alien off for a moment while you make your escape, but the beast is essentially bullet-proof and invincible and this makes the game absolutely terrifying, brutal and lovely. There are different tools and methods you can utilize to attract the creature to one area while you evade it from an escape route you’ve created. Even still, as part of the game’s programming, the creature will learn and adapt based on what you’ve used before. You can keep track of where it is with your motion tracker, but be careful, if it hears it, it will find you–and when it finds you, it’s instant death. I think I evaded it while it was running at me exactly once, and every time after that it’s resulted in my character being splayed open graphically. Some of the harsher reviews I’ve read have criticized the game as being solely within the confines of hiding, is boring and tedious. The game depends entirely on how you play it. Always keep moving. Be careful and be quiet and if you see it… hide! 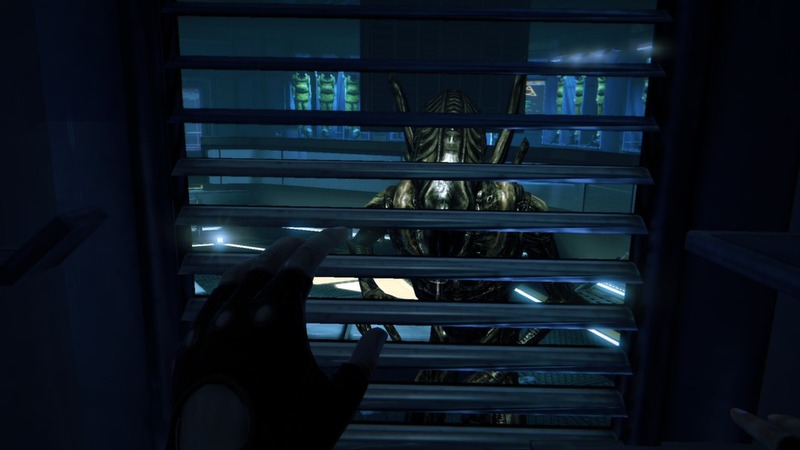 If your entire gaming philosophy on this is to keep hiding, keep hiding, it’s going to get boring because the Alien is going to eventually find you and if you’re spending your time hiding in a locker, and then dying, it’s going to get real old real quick. Alien: Isolation is absolutely difficult and witnessing the creature stalking the depths of the shadows is terrifying, but if you strategize and learn how to play the game as it is, it’s going to be a good time. I agree with some of the reviews saying that it’s too long. It is. Alien: Isolation isn’t perfect, but that’s okay. Nothing is. The game’s setting, the total look and design, and the sound design are all enough to carry the game–but the real thrill is being hunted by that goddamn alien. By and large, games taking place in the Alien universe have been boring or worse (except for the original AVP games for PC). It’s great to see a title finally come out to the movie series some justice, especially considering this is coming out not too long after the oft-maligned Colonial Marines. While I love the VHS-quality 20th Century Fox logo as a metro nod to the 1979 original, prior to that is it too much to ask for the Sega logo to pop up with that classic, “Seeeeega!”?